Products with virtuous features provide consumers with alternative choices to regular products, and retailers endeavor to use price promotions to propel sales of these products. Despite this, marketing scholars have paid intermittent attention to the effect of price promotions of virtue and vice products on sales using scanner data. Virtue and vice products are related concepts (Parreño-Selva, Mas-Ruiz, and Ruiz-Conde 2014). They differ in the gain and loss domain, such that relative vices refer to products that provide immediate benefits (e.g., the good taste of crisps) but delayed costs (e.g., obesity in the future) and relative virtues refer to products that have immediate costs (e.g., the bad taste of oat bran) but delayed benefits (e.g., good health in the future). Healthy and unhealthy foods fall into the category of relative virtue and vice products (Kivetz and Keinan, 2006; Thomas, Desai, and Seenivasan 2011), respectively. An unhealthy food offers an immediate gratifying experience but has negative long-term outcomes, and a healthy food offers a less gratifying experience in the short run but has fewer negative long-term outcomes (Wertenbroch 1998). Moreover, although retail sales of relative virtue and vice choices have proliferated in both healthy food (e.g., low-sugar vs regular baked beans) and unhealthy food (e.g., low-fat vs regular crisps), scant marketing research has shed light on whether the promotion effects of relative virtue or vice choices differ across healthy and unhealthy products. We uncover this neglected but important side of the price promotion effects of virtues and vices by hypothesizing that consumers have differential responses to the relative virtue and vice choices of healthy and unhealthy food. This study aims to contribute to the literature by generating a greater understanding of the debate over whether price promotions are more effective for virtue or vice products. To our knowledge, the only two studies related to price promotions of virtue and vice products using scanner data are those of Wertenbroch (1998) and Parreño-Selva et al. (2014). Wertenbroch (1998) proposes that consumers of vice products impose self-control by limiting the quantity bought and that this purchase quantity rationing makes them less likely to purchase large quantities in response to price promotions. This argument supports the observation that the price promotion effect is smaller for vice than virtue products. In contrast, Parreño-Selva et al. (2014) propose that anticipating long-term regret over not choosing vice products increases the propensity to choose vice over virtue at the moment of price promotion. Therefore, this argument supports a greater price promotion effect for vice than virtue products. These studies thus find opposite results as to whether the effect of price promotions is greater for vices or for virtues. These mixed findings suggest that the price promotion effect can be masked, and apart from factors such as purchase context (e.g., store type), marketing factors (e.g., brand type), and specific food categories (e.g., utilitarian/hedonic), we surmise that this is due to a lack of a nuanced classification of virtues and vices. For example, the empirical evidence Parreño-Selva et al. (2014) provide is based on alcoholic and non-alcoholic beer. As beer is an addictive vice product (see Kivetz and Keinan 2006), their study examines the price promotion effect only on an unhealthy product.1 This leaves the question unanswered as to how the price promotion effects on relative vice and virtue choices vary across healthy and unhealthy products. We propose that a separate examination of relative vices and virtues for healthy and unhealthy products would shed more light on the price promotion effects of virtues and vices. We argue that the self-control pattern differs across healthy and unhealthy products, such that consumers exhibit more self-control over unhealthy products because their natural impulse to consume such products is stronger. In line with this argument, the price promotion effects of relative virtues and vices differ across healthy and unhealthy products. For healthy products, consumers exhibit relatively more self-control by limiting the purchase quantity of vice choices and are more likely to choose virtue choices to adhere to their healthy-eating goals. Therefore, the price promotion effects are smaller for virtue choices of healthy products than for vice choices. In contrast, for unhealthy products, consumers exhibit relatively less self-control and greater impulsive urges (Hoch and Loewenstein 1991; Shiv and Fedorikhin 1999); thus, temptation mechanisms such as price promotions (Nakamura et al. 2015) lead to vice choices of unhealthy products. Therefore, the price promotion effects are stronger for vice choices of unhealthy products than for virtue choices. This is the central point in the theoretical development of this study. To address this neglected but important issue, we provide a more nuanced classification of virtues and vices, which we divide into four categories, and compare the price promotion effects between them: (1) a healthy virtue product (HVT) refers to a product with virtuous features in a healthy food (e.g., low-sugar baked beans, low-calorie fruit juice), (2) a healthy vice product (HVC) refers to a product with no or fewer virtuous features in a healthy food (e.g., regular baked beans, regular fruit juice), (3) an unhealthy virtue product (UHVT) refers to a product with virtuous features in an unhealthy food (e.g., low-fat crisps, low-alcohol beer), and (4) an unhealthy vice product (UHVC) refers to a product with no or fewer virtuous features in an unhealthy food (e.g., regular crisps, regular beer). Moreover, as consumer choices differ across social classes and pricing strategies vary across store types, this study aims to provide generalized findings related to the price promotion effects of HVT, HVC, UHVT, and UHVC across different social classes and store types. This study hypothesizes that sales are more sensitive to the price promotion of a relative virtue choice than to that of a relative vice choice of healthy food and more sensitive to the price promotion of a relative vice choice than to that of a relative virtue choice of unhealthy food. We propose this for two reasons. First, self-control is less required for healthy food consumption than for unhealthy food consumption (Shiv and Fedorikhin 1999; Thomas et al. 2011); thus, consumers are better able to adopt self-control by limiting their purchase quantity of vice choices in healthy than unhealthy food consumption (Wertenbroch 1998). Consumers of healthy products exhibit a deliberate and strong goal for healthy eating (Thomas et al. 2011); thus, they are more likely to adopt strong self-regulation to adhere to this important goal by purchasing more virtue than vice choices of healthy food in response to a price promotion. Second, consumers exhibit greater impulses to consume unhealthy food, and this causes more differential self-control problems (Ramanathan and Menon 2006; Shiv and Fedorikhin 1999). Therefore, the price promotion is a tempting mechanism that depletes one’s self-regulation resources to justify vice choices of unhealthy food. Consumers exhibit distinct levels of self-control over healthy and unhealthy food. Self-control problems arise from impulsive behavior (Wertenbroch 1998). Baumeister (2002, p. 670) defines impulsive behavior as “behavior that is not regulated and that results from an unplanned, spontaneous impulse” and thus goes against one’s self-interest and long-term goals. Unhealthy foods are more likely to be consumed on impulse (overweigh present, immediate consequences) because impulsivity is an influential antecedent of unhealthy food consumption (Metcalfe and Mischel 1999; Rook 1987). The emotive imagery and associated desire for unhealthy products (e.g., cookies, doughnuts, cakes) trigger impulsive purchase decisions (Loewenstein 1996; Shiv and Fedorikhin 1999; Thomas et al. 2011; Wertenbroch 1998). This idea is in line with marketing scholars’ findings that the impulse to consume unhealthy food is stronger than that to consume healthy food (Talukdar and Lindsey 2013). Therefore, unhealthy food poses a greater need for self-control than healthy food. Moreover, healthy eating is a more mindful, planned, and deliberative behavior (see Thomas et al. 2011) because consumers often portray healthy eating as a goal. Therefore, purchase decisions associated with healthy products are more “deliberative” (Thomas et al. 2011) and reflect consumers’ healthy-eating goals. According to goal congruency theory (Fishbach and Zhang 2008), when an individual’s key goal is activated by a choice set, he or she is more likely to adhere to that goal and declare a positive evaluation of the congruent choice. This argument is built on research and theory related to the dynamics of self-regulation (Fishbach and Dhar 2005; Fishbach, Dhar, and Zhang 2006). Self-regulation dynamics can be distinguished as highlighting and balancing dynamics, which Fishbach and Zhang (2008, p. 548) describe as follows: “in a highlighting dynamic, individuals consistently choose alternatives that are in alignment with the more important goal, whereas in a balancing dynamic, individuals alternate between that high-order goal and a low-order temptation in successive choices.” Thus, when an individual chooses to purchase a healthy product, a healthy-eating goal is activated and his or her self-regulation system enters a highlighting dynamic. Under such a dynamic, the individual puts higher value on the long-term goal (i.e., long and healthy life) than on the short-term goal (i.e., eating tasty but unhealthy food) and is more likely to make choices adhering to the long-term goal. Therefore, consumers are more likely to buy more relative virtue than vice choices of healthy food on sale. A price promotion has a stronger effect on virtue choices of healthy food than on vice choices of healthy food. In contrast, we propose that price promotion effects are stronger for vice than virtue choices of unhealthy food because consumers have less self-control over unhealthy food and price promotions act as a tempting mechanism to provide a license/justification for making unhealthy vice choices. It is a well-established notion that consumers exhibit greater impulses to consume unhealthy food and have greater self-control problems over unhealthy food (Raghunathan, Walker-Naylor, and Hoyer 2006; Ramanathan and Menon 2006; Shiv and Fedorikhin 1999; Ubel 2009; Vohs and Heatherton 2000). The impulsive consumption literature provides several reasons for this notion. Shiv and Fedorikhin (1999) propose that unhealthy food is preferable to healthy food because of the individual’s natural affective responses to unhealthy food. Raghunathan et al. (2006) posit that individuals operate under the “unhealthy = tasty” intuition, which leads to the choice of unhealthy food. Vohs and Heatherton (2000) find that self-regulation failure is caused by the depletion of an underlying cognitive self-regulating resource. Ramanathan and Menon (2006) assert that impulsive behavior is driven by an activation chronicity of hedonic/pleasure-seeking goals. Moreover, it is more difficult to resist unhealthy than healthy food when the consumers’ utility from immediate gratification exceeds their disutility from long-term unhealthiness (Ubel 2009). Therefore, it is a steep challenge to regulate impulsive purchases and unhealthy food consumption. Moreover, the licensing effects of price promotions strengthen the preference for relative vice choices of unhealthy food by depleting consumers’ limited self-control resources. Consumers’ hedonic, visceral, and pleasure-seeking goals cause them to experience desires for unhealthy/indulgent/luxury products (Shiv and Fedorikhin 2002). However, such goals may conflict with others, such as having healthy and long lives, and cause intense ambivalence (Ramanathan and Menon 2006). It is thus more difficult to justify the vice choices of unhealthy food over virtue choices. In line with the self-control literature, the licensing effect increases “the preference for a relative luxury by dampening the negative self-attributions associated with such items” (Khan and Dhar 2006, p. 264). Self-regulation resources are limited, and their depletion leads to self-regulation failure (Vohs and Heatherton 2000). Tempting mechanisms such as price promotions (see Nakamura et al. 2015) and credit (see Thomas et al. 2011) diminish one’s capacity for self-regulation by offering rewards (e.g., paying less, gaining credit, curbing pain of paying, relieving guilt) (Lee-Wingate and Corfman 2010). Price promotions can thus lend justification for buying more impulsive choices (i.e., vice-unhealthy food). Therefore, consumers are more likely to buy more vice than virtue choices of unhealthy food on sale. A price promotion has a stronger effect on vice choices of unhealthy food than on virtue choices of unhealthy food. Data collection took place at three types of grocery stores in the United Kingdom: hi-lo store, everyday low-price store, and convenience store. We examined four product categories depending on their healthiness. According to the findings of one of the most thorough nutrient profiling surveys (see Scarborough, Rayner, Stockley, and Black 2007), we categorized these four products as relatively healthy (i.e., baked beans and fresh fruit juices) or relative unhealthy (i.e., crisps and beer).2 Any brand labeled “low fat” (crisps), “low sugar” (baked beans), or “low calorie” (fresh fruit juices) represented the relative virtues within the product category. Owing to a lack of observations for non-alcoholic beer, we adopted an approach similar to Wertenbroch’s (1998) and contrasted regular and light beer.3 We categorized all the brands as relative virtue and relative vice sub-categories within each product category and applied the store/national brand indicator as another brand-related characteristic. Table 1 presents the overview cross-tabulation of choice (1 = virtue choice, 0 = vice choice). Approximately 10% of all the purchases are relative virtue choices, with 56% of the virtue choices made on healthy food and 44% made on unhealthy food. The transaction data set contains 1,497,243 observations for 18,097 UK households between October 2002 and February 2009 across four product categories. The variables in this data set include quantity, price,4 and amount paid, which can be matched with the product category and brand name through universal product codes (UPCs). Consumer demographic variables such as age, household size, and social class were collected from household surveys and can be matched with the transaction data set through consumer panel ID. Table 2 shows the summary statistics of the variables. Beer has by far the largest price dispersion, and the most expensive beer costs 10 times more than the cheapest beer. We construct an indicator variable for virtuous features. When a category offers a virtuous feature of relative virtue (RV it ), its RV it is 1 and 0 otherwise. Thus, the third panel in Table 2 shows that baked beans and beer with virtuous features are more frequently purchased across all the observations (11 and 18%, respectively) than fresh fruit juices and crisps (9 and 2%, respectively). The bottom panels of Table 2 present summary statistics related to consumer characteristics, including social class, age, and household size. Among the participant households in the data set, the primary shopper is 49 years of age on average (with the youngest 18 and the oldest 89) and has about 3 family members. where lnQ it is the logarithm of sales for UPC i at time t, RV it is the indicator of the choice (1 = relative virtue, 0 = relative vice) for UPC i, lnPrice it is the logarithm of the unit price paid for UPC i at time t, NB ik is the indicator of national brand (1 = national brand, 0 = store brand) for UPC i within each category k, ST i is the type of stores visited for each shopping occasion, SC i is the social class for each household, AG i indicates the age of the primary shopper in each household, HS i indicates the size of each household, and ε it is the error term (i.i.d. N ~ 0, σ2). When β 3 > 0, the absolute value of the price coefficient of relative virtue is lower than the absolute value of the price coefficient of relative vice. In contrast, when β 3 < 0, the absolute value of the price coefficient of relative virtue is higher than the absolute value of the price coefficient of relative vice. Therefore, the significance level and sign of β 3 determine how the price promotion effects vary across relative virtue and vice. The negative sign of β 3 indicates that the price promotion effect is stronger for the relative virtue choice than the relative vice choice and vice versa. We estimate the effects of price on sales for the relative virtue and vice choices of four product categories based on model 1. Thus, we estimate four sales equations with three key variables of interest: β 1 for lnPrice it , β 2 for relative virtue, β 3 for the interaction term of lnPrice it and RV it , and the control variables. Table 3 shows the regression results of the price effects and various statistics. All four equations are significant at the 0.01 level, and the R 2 values range from 0.1 to 0.7, indicating good model fit and high predictive adequacy. The variance inflation factors indicate that there are no multicollinearity problems in any of the equations. As Table 3 shows, the estimated models suggest that, as expected, prices have a negative and statistically significant effect on sales in all four categories, lnPrice it . The coefficients of the interactive term, β 3(RV it × lnPrice it ), are negative and significant for both the healthy products (Baked Beans : β 3 = − 0.520 , p < 0.01 ; Fresh Fruit Juices : β 3 = − 0.158 , p < 0.01) and positive and significant for both the unhealthy products (Crisps : β 3 = 0.064 , p < 0.01 ; Beer : β 3 = 0.905 , p < 0.01). The price elasticity of regular baked beans is −0.346 (β 2 = − 0.346, p < 0.01), and the price elasticity of low-sugar baked beans is the sum of β 2 and β 3 , or −0.866 (β 2 = − 0.346 , p < 0.01 ; β 3 = − 0.520 , p < 0.01). The price elasticity of regular fresh fruit juices is −0.358 (β 2 = − 0.358, p < 0.01), and the price elasticity of low-calorie fresh fruit juices is −0.516 (β 2 = − 0.358 , p < 0.01 ; β 3 = − 0.158 , p < 0.01). Thus, consumers are more sensitive to the price of low-sugar baked beans than to regular baked beans and also more sensitive to the price of low-calorie fresh fruit juices than to regular fresh fruit juices. The price elasticity of crisps is −1.041 (β 2 = − 1.041, p < 0.01), and the price elasticity of low-fat crisps is the sum of β 2 and β 3 , or −0.977 (β 2 = − 1.041 , p < 0.01 ; β 3 = 0.064 , p < 0.01). The price elasticity of regular beer is −1.961 (β 2 = − 1.961, p < 0.01), and the price elasticity of low-alcohol beer is −1.056 (β 2 = − 1.961 , p < 0.01 ; β 3 = 0.905 , p < 0.01). Thus, consumers are more sensitive to the price of regular crisps and regular beer than to the price of low-fat crisps and low-alcohol beer. Therefore, H1 and H2 are supported. To test the robustness of the results of our main model (model 1), we perform three additional checks. First, we test whether the results differ across store types. We estimate 12 sales equations for four product categories purchased in the hi-lo, everyday low-price, and convenience stores, respectively. The 12 store-type equations are based on model 1 without using ST i as a control variable. Second, we test whether the results differ across consumer groups. We estimate an additional 12 sales equations for four product categories purchased by lower-, medium-, and higher-level social class groups, respectively. Similar to the store-type equations, the 12 social class equations are based on model 1 without using SC i as a control variable. Overall, we estimate 192 parameters for 24 equations for the first and second robustness checks. To simplify our results, we present only three coefficients for each equation in Table 4: β 1 for lnPrice it , β 2 for relative virtue, and β 3 for the interaction term lnPrice it × relative virtue. As Table 4 shows, the across-store-type results and the across-consumer-group results in Table 4 are consistent with the overall results shown in Table 3. In summary, we find consistent price promotion effect patterns on the relative virtue and vice choices of healthy and unhealthy food across the different types of stores and different consumer groups. Third, we test whether the results vary across model specifications with a set of regressions for each product category. Model 2 includes three key predictors—relative virtue (RV it ), lnPrice (lnPrice it ), and RV it × lnPrice it . Model 3 includes three key predictors and the demographic characteristics (i.e., social class, age, and household size). Model 4 includes three key predictors and the marketing factors (i.e., brand type and store type). The results of models 2–4 are consistent with those of model 1.5 Furthermore, price elasticities are consistent across models, such that baked beans and fruit juices have relatively smaller price elasticities than crisps and beer. The former two are necessity products and less price elastic than the latter two, which are indulgent products. In addition, the model specification of model 1 outperforms specifications of models 2–4. This study extends existing literature in two important ways. First, it directly compares the effects of price promotions on the relative virtue and vice choices of healthy food sales (e.g., low-sugar vs regular baked beans) and relative virtue and vice choices of unhealthy food sales (e.g., low-fat vs regular crisps). Second, it provides generalized finding of these effects using scanner sales data combined with store type and social class information. The hypotheses are based on the different levels of self-control consumers need when purchasing healthy and unhealthy food (the degree of impulse buying) and goal congruency theory. Data analysis empirically reveals a greater price promotion effect on relative vice choices of unhealthy food (i.e., beer and crisps) than on relative virtue choices, but a smaller price promotion effect on relative vice choices of healthy food (i.e., baked beans and fresh fruit juices) than on relative virtue choices. Moreover, the effect pattern of price promotions on the relative virtue and vice choices of healthy and unhealthy food is constant across different types of stores and different groups of consumers. In addition, the study shows that examining the price promotion effects of relative virtue and vice choices without conceptualizing the price promotion effects across healthy and unhealthy products separately is inappropriate, as the effects of price promotions differ across these products. For healthy food, as predicted, demand for relative vice choices is less price sensitive, resulting in a crossover of demand as prices increase. In other words, demand for relative vice choices is increasingly constrained when price constraints are relaxed during the price promotion period, even if these choices are more palatable than their virtue counterparts. Moreover, healthy eating is deliberative, and consumers are engaged in a highlighting dynamic of regulation when they purchase healthy food; thus, they are more likely to buy more virtue choices of healthy food on sale to adhere to their healthy-eating goals. This finding lends support to our contention that consumers are more capable of adhering to a self-imposed constraint on vices in healthy food consumption than in unhealthy food consumption. In contrast, price promotions play a more vital role in boosting sales of relative vice choices of unhealthy than healthy food. For unhealthy food, demand for relative vice choices is more price sensitive, resulting in a sales boost through the price promotion. This finding confirms the notion that consumers exhibit a greater impulse for unhealthy than healthy food. Moreover, price promotion functions as a tempting mechanism to justify relative vice over virtue choices of unhealthy food. Thus, stronger impulsiveness in unhealthy food consumption and the temptation of price promotions explain why consumers are more price sensitive to relative vice choices of unhealthy food than to relative virtue choices of unhealthy food. The effect pattern, which shows that the effects of price promotions on relative virtues and vices are constant across different types of stores, indicates that the different pricing strategies of stores are not factors that drive consumers to choose virtues over vices. Consumers exhibit a similar choice pattern in choosing relative virtues and vices when they shop across different stores. Furthermore, the price promotion effects of relative virtues and vices are consistent within each social class of consumers. Thus, even if consumers have different reasons for choosing virtues over vices and different price sensitivities across social classes, the stronger effect of virtue in price promotions for healthy food and the weaker effect of virtue in price promotions for unhealthy food do not change across social classes. This implies that consumers’ degree of impulse buying and the self-control problem are the dominant factors determining the effectiveness of price promotions on relative virtues and vices across healthy and unhealthy food. These results have important managerial implications, especially for retailers that want to propel sales of both virtues and vices in healthy and unhealthy foods and manufacturers that want to negotiate profitable marketing plans with retailers. 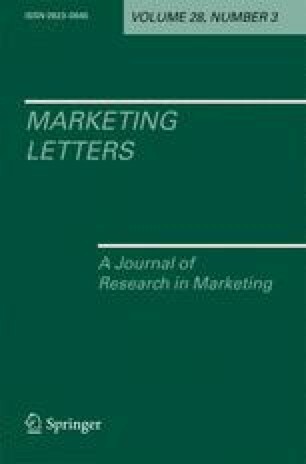 In particular, the stronger effect of virtue in price promotions for healthy food and the weaker effect of virtue in price promotions for unhealthy food indicate that marketing managers should differentiate price promotions for different types of products. Manufacturers of healthy food should give priority to price promotions for relative virtue choices because these promotions are more profitable than those for relative vice choices. For example, Heinz should negotiate with retailers to develop joint sales plans that focus on price promotion activities for low-sugar rather than regular baked beans. In contrast, manufacturers of unhealthy food should prioritize price promotions for relative vice choices because such promotions are more profitable than those for relative virtue choices. For example, Pringles should persuade retailers to conduct price promotion plans more frequently on its regular rather than reduced fat crisps. Moreover, retailers and manufacturers need to lower their expectations of the effects of price promotions on relative virtue choices in unhealthy food and relative vice choices in healthy food. For example, retailers should encourage Heineken to self-fund the price promotion costs of its low-alcohol products. They should also suggest that Tropicana decrease the price promotion frequency on its regular orange juice. Our findings show the danger of adopting a homogeneous price promotion strategy for different types of food and provide valuable information for retailers and manufacturers to make joint price promotion decisions to attract consumer support and purchases. The findings also provide useful information for public policy makers to effectively decrease unhealthy vice purchases. That price promotion has a stronger effect on the vice than virtue choices of unhealthy food indicates that price is a strong stimulus triggering more vice-unhealthy food than virtue-unhealthy food. Limiting the frequency of price promotions to vice-unhealthy food can effectively curb the temptation mechanism and thus drive consumers to purchase less vice-unhealthy food. Applying surcharges to vice-unhealthy food is a straightforward way to highlight financial disincentives and therefore significantly drive healthier consumption choices. This study has some limitations that should be considered when interpreting its results and contributions. The first limitation pertains to our measure of the effectiveness of price promotions. Our arguments focus mainly on the own price promotion effect of each type of product. Although empirical research has demonstrated the cross-effects of price promotions (see Parreño-Selva et al. 2014), we cannot argue that our study captures this effect, due to a lack of store-level transaction data to estimate cross-effects. The second limitation involves the number of products examined in this study. Although we examined four products, a lack of consumer-level transaction data prevented us from including additional products. Our findings also provide avenues for further research. We assess consumer purchase behavior only from scanner data. A lab experiment could be conducted to test the psychological process (e.g., impulsiveness, a highlighting dynamic of regulation) behind buying behavior. A 2 (virtue/vice) × 2 (healthy/unhealthy) × 2 (promotion yes, promotion no) design with attitudinal and process-dependent variables could extend scanner data-based studies to delineate the psychological process. Such a study could be distinguished strongly from investigations based solely on scanner data. Moreover, that low-fat labeling increases food consumption for both normal-weight and overweight people (Wansink and Chandon 2006) suggests that consumers’ actual consumption of relative virtue/vice products is different from their purchases of such products (especially price-incentivized purchases). Thus, future studies could investigate price promotion effects by accounting for the differences between purchases and actual consumption of relative virtue/vice products. In addition, the price promotion effects may vary between current and future choice behavior because buying virtues at time t may lead to buying vices at time t + 1 (Hui, Bradlow, and Fader 2009). Therefore, future studies could explore the degree to which price promotion effects vary from time t to time t + 1 according to consumers’ previous choices between relative virtues and vices. Following Kivetz and Keinan (2006), Thomas et al. (2011), and Wertenbroch (1998), we characterize vice products as unhealthy products. We conducted a post-test on 95 random UK consumers to evaluate the degree of healthiness of baked beans, fresh fruit juices, crisps, and beer. The results show that 71 and 66% of the participants perceived baked beans and fresh fruit juices as healthy products, respectively, and 73 and 73% of the participants perceived crisps and beer as unhealthy products, respectively. Therefore, consumers’ perceptions of the classification of healthy versus unhealthy products for these four products are in accordance with this study. Because 1–4% alcohol by volume (ABV) is considered low alcohol content, we use any brand of beer labeled “ABV1.3 up to 3.3%” and “ABV 3.4 up to 4.1%” to present the relative virtue choice in this product category. As there is no specific “low ABV” label for beers, we conducted a post-test on 95 random UK consumers, and the results show that 82% of the participants considered low ABV beer healthier than regular beer. Furthermore, 70% of these participants reported that low ABV content was the key factor in identifying a healthier/unhealthier beer. The quantity and prices are standardized because items sold within the same category may differ in terms of package size or be measured in inconsistent units. The quantity and price standardization details are available on request. Results are available on request. The authors thank TNS UK Ltd. for providing the panel and survey data used in this research. The use of these data does not imply the endorsement of TNS UK Ltd. on the interpretation or analysis of the data. All errors and omissions remain the responsibility of the authors. Ji Yan received financial support from China National Social Science Fund (Grant No. 12CJL015), The Humanities and Social Science Project of the Ministry of Education (Grant No. 12YJC790222), and the Social Science Funding of Hunan Province (Grant No. 11YBA282). Kun Tian received financial support from China National Social Science Fund (Grant No. 11CJL017) and the Social Science Funding of Hunan Province (Grant No. 2010YBA215).